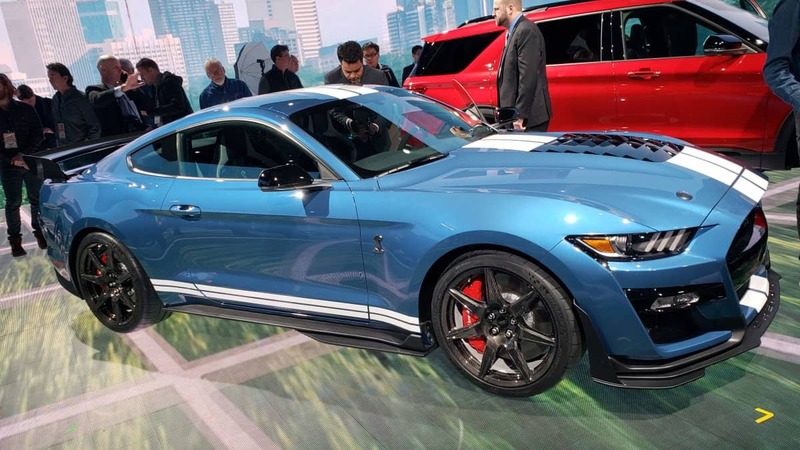 The 2020 Ford Mustang Shelby GT500 finally made its world debut this morning at the 2019 North American International Auto Show in Detroit, and while we don’t know how much power the supercharged Stang will offer, we can look at how it will stand up to the in-class competition from Chevrolet and Dodge. The first thing that pretty much everyone wants to know about the 2020 Ford Mustang Shelby GT500 is “how much power” and said, we still don’t know. Ford representatives have said that we will have to wait until closer to the on-sale date in the fourth quarter of this year to get the horsepower and torque figures, along with the curb weight and pricing. However, we know pretty much everything else that there is to know, allowing us to compare it – based strictly on specs and features – to the Dodge Challenger and the Chevrolet Camaro. The Ford Mustang Shelby GT500 serves as the pinnacle of the Mustang lineup, packing a supercharged V8, a high performance suspension setup, a world class braking package and the best aerodynamics that the Motor Company has ever achieved on a pony car. While we don’t know the final power ratings, Ford has promised that this will be the most powerful Mustang ever, along with being the most power road-going vehicle that they have ever offered. With all of that in mind, the new GT500 will go head-to-head with the Chevrolet Camaro ZL1 and the Dodge Challenger SRT Hellcat. The Camaro is offered in two variants – the ZL1 and the ZL1 1LE – and the Challenger is offered in two variants as well – the Hellcat and the Hellcat Redeye. The Camaro ZL1 and ZL1 1LE both come with the same supercharged 6.2-liter V8 with 650 horsepower and 650 lb-ft of torque, with the key difference of the 1LE being a high performance handling and aero package. The Challenger Hellcat offers 717 horsepower and 656 lb-ft of torque while the Redeye offers 797 horsepower and 707, with each being offered in standard-width or widebody form. We don’t know the Mustang’s power numbers, but we do know that Ford has promised 0-60 times in the mid-3-second range along with sub-11-second quarter mile times. The Camaro ZL1 with good traction is a generally a low 11-second car, with the quickest running into the high 10s. The same is true of the Challenger Hellcat, while the stronger Redeye runs in the high tens – again, with good traction. The standard Hellcat will get to 60 in about 3.7 seconds, which I have experienced often in my own Challenger, while the Redeye can get down into the 3.3-3.4 range. The Camaro ZL1 will also get to 60 in 3.5-3.6 seconds, so based on Ford’s vague, initial performance times, the new GT500 will be a pretty even competitor for the Camaro ZL1 and the Challenger Hellcat on the drag strip (or a straight stretch of street), while the Redeye models should have the advantage over the Shelby. At the same time, Ford could be keeping their cards close their chests here, under-promising on performance numbers. Say that the “mid 3-second” 0-60 time is a 3.3 and that “sub 11-second quarter mile” is a low 10 and not a high 10, then owners of all other stock, supercharged muscle cars are going to have a tough time taking down the new Mustang in a straight-line battle. Ford engineers involved with the GT500 make no bones about the fact that this new Shelby is not made to be a drag car, instead being built to be an incredible all-around performer. The GT500 with the Carbon Fiber Track Package with the big rear wing, the carbon fiber wheel wrapped in Michelin Pilot Super Sport tires and the front aero bits is reasonably comparable to the Camaro ZL1 1LE, and when it comes to road course lap times, these two should be battling for muscle car supremacy. Not to say that the Challenger Hellcat isn’t a solid road course machine, but in all reality, the ZL1 1LE comfortably beats the Hellcat cars around tracks with turns and the features of the GT500 are more in line with the Camaro. Those features include the MagneRide suspension system, the biggest brakes ever offered on any sports coupe from an American automaker, the sticky rubber on the extremely-lightweight carbon fiber wheels and, of course, the elaborate aerodynamics of the new Mustang. For comparison, the Camaro ZL1 1LE has huge-but-not-as-huge Brembo brakes, not-as-light wheels wrapped in similar rubber, the Magnetic Ride Control suspension setup and its own extreme aero package. Don’t be ridiculous. No one cares about the fuel economy of any of these vehicles, so we aren’t even going to address this. Anything over 20 miles per gallon on the highway would be a nice advantage for GT500 owners, as that is what most Hellcat and ZL1 owners see, but fuel economy is nothing more than a nice perk with these cars. No one will buy any of the cars being discussed here based on fuel economy, and I just added this part in as a joke. Finally, in addition to all of the high performance goodies around the outside of the car, the new GT500 comes with a loaded cabin, similar to that of the Camaro ZL1 and the Challenger Hellcat. The new Shelby has the company’s huge instrument panel screen and the big SYNC infotainment screen high on the dash, so when it comes to interior features the GT500 should be right on par with the ZL1 and the Hellcat. Of course, if Ford announces final numbers of something like 790 horsepower (which is one of the current rumors), the lighter form of the GT500 could give it an advantage over the 797-horsepower Challenger Redeye and every other car in the segment. In any case, the new Shelby Mustang should beat the Camaro and “regular” Hellcat in a drag race while struggling with the Redeye and on a road course, it will likely lay waste to the Challengers while being a worthy competitor for the Camaro ZL1 1LE. I like to think that the GT500 will be more like a beefier GT350 than a Demon hunter, drag racer. Of course ideally it will excel at both. The big problem with high HP monsters with RWD is simply traction, and all too often the 9-10 second 1/4 mile car is running 11s without drag radials and a well prepped, gummy track. Great handling and braking on the other hand is valuable for all drivers on all roads. So I have high hopes for the GT500, but my hopes are that it is a balanced performer, and not a one trick pony.